A true classic, with a twist. Brahms Mount iconic Monhegan Soft White Ground Throw features a large-scale herringbone pattern finished with a flourish of hand-twisted and knotted rope fringe and an iconic selvedge (a beautiful byproduct of the antique loom it's woven on). Dense, luxurious, plush and practical, in a variety of hues all of which are against a soft white cotton ground, this throw adds the perfect punch to any space. It’s also the ideal one-size-delights-all gift. Wash separately cold water, gentle cycle. Liquid detergent without bleach or brighteners. Tumble dry delicate, low or no heat. A true classic, with a twist. 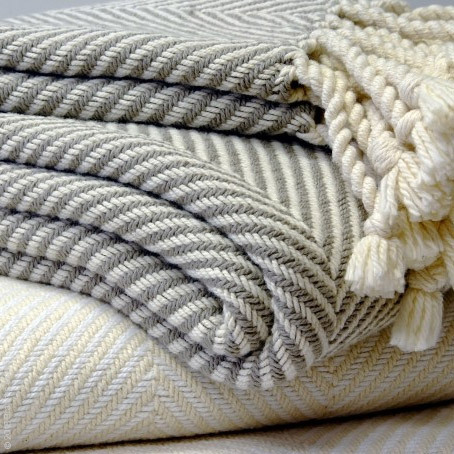 Brahms Mount iconic Monhegan Soft White Ground Throw features a large-scale herringbone pattern finished with a flourish of hand-twisted and knotted rope fringe and an iconic selvedge (a beautiful byproduct of the antique loom it's woven on). Dense, luxurious, plush and practical, in a variety of hues all of which are against a soft white cotton ground, this throw adds the perfect punch to any space. It’s also the ideal one-size-delights-all gift. 100% U.S.A. cotton 48 x 70 inches plus fringe Many colors Soft white ground True selvedge Hand-twisted fringe Made in the U.S.A. Wash separately cold water, gentle cycle. Liquid detergent without bleach or brighteners. Tumble dry delicate, low or no heat.